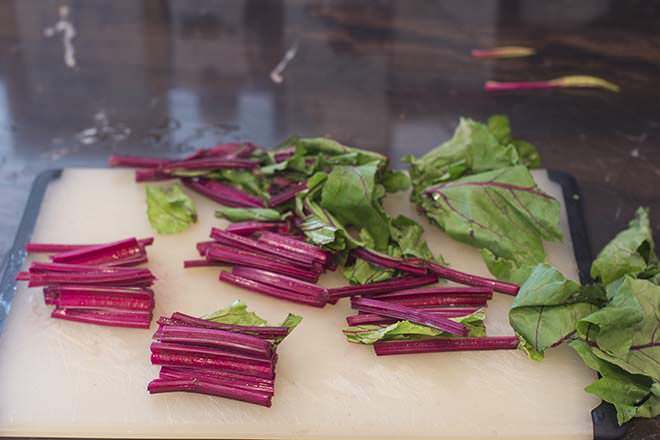 The stems and leaves from beets are totally edible and extremely delicious. 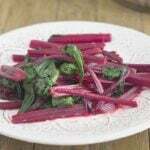 Learn how to cook beet greens here. Beets are probably my favorite vegetable. I showed you how I love to cook them the other day (roasted whole and unpeeled so that they’re not messy to prepare, but delicious to eat). What I actually love even more than the beets though, are the beet greens. What I mean by beet greens are the scarlet stems and the green leaves attached to them. They are completely edible and have a flavor like Swiss chard (and many other dark greens) but sweeter. If you grow your own beets, you can harvest some of the leaves and stems as the beets are growing underground. When the stems and leaves emerge and the leaves are still small (2 inch long leaves) you can trim them and eat them raw in salads. They’re delicate and soft and work perfectly for this. Try adding them to a salad that contains beets for a double beet-flavored punch. The colors are really pretty too. Once they start to get larger (4+ inches long), you can cut half of them from each plant and then cook them as described below. When you buy beets from the grocery store or farmer’s market, they usually come in a bunch of 3-5 beets with the stems and leaves attached. If the leaves are bruised and brown or yellow in spots, they are not ideal for eating. If they are nice and green and healthy-looking, they are ideal to cook and eat, no matter their size. 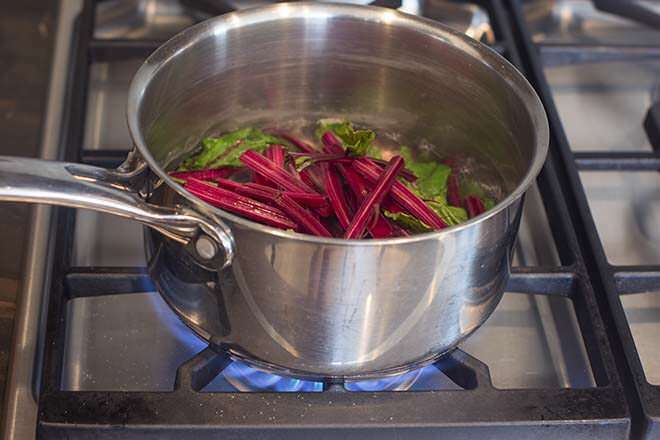 So, how do you cook beet greens? Trim the beet greens from the beets. 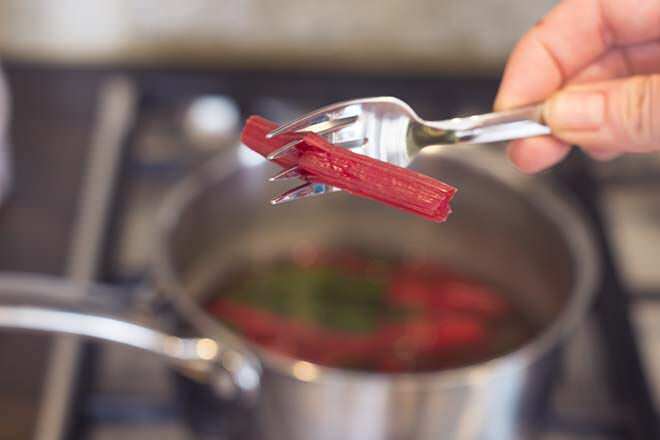 I leave a good inch of stem attached to the beets because that’s best for roasting beets (it stops the beets from bleeding red as much if you don’t actually cut into their flesh, as I explain here). Cut the stems and leave into 2-inch pieces. Then put the pieces into a colander and rinse them really well. Often there is a lot of sandy, grainy dirt on the stems and leaves and you want to get rid of that. 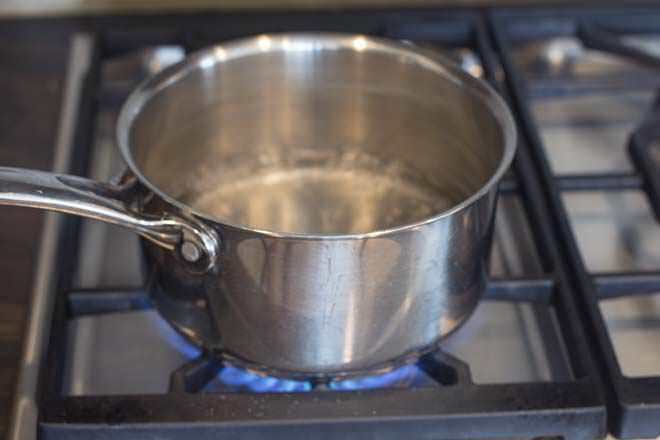 Put about an inch of water into a medium saucepan and bring it to a boil. Add about 1/2 teaspoon of salt and stir it in. Add your stems and leaves to the saucepan. Bring it back to a boil over high heat and then stir and reduce to a simmer. Cook for 3-5 minutes until a stem is very soft when pierced with a fork. Drain the beets. Be sure to use a clean colander. You don’t want the dirt from before to end up on your cooked greens. Note that at this point, you can use the beets in a variety of other recipes. 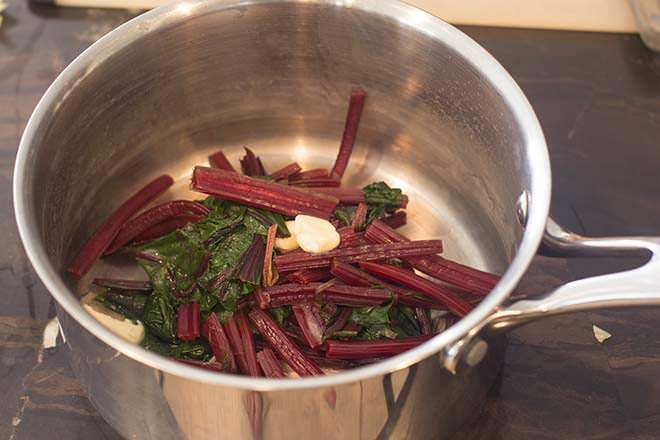 Here’s a nice recipe for beet greens sauteed with garlic. 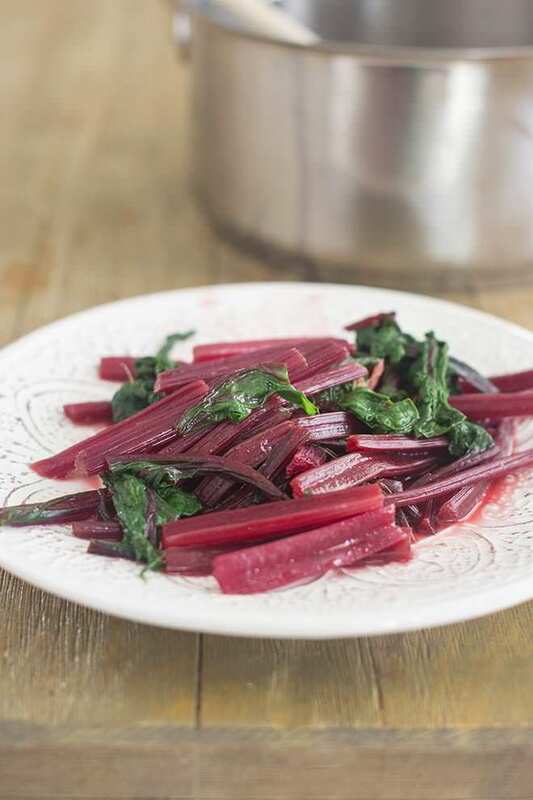 If you’re not using the greens in another recipe but are eating them as is, return the beet greens and stems to the saucepan or a serving dish and add about 1/2 tablespoon of butter. Stir and taste. Add salt if desired. 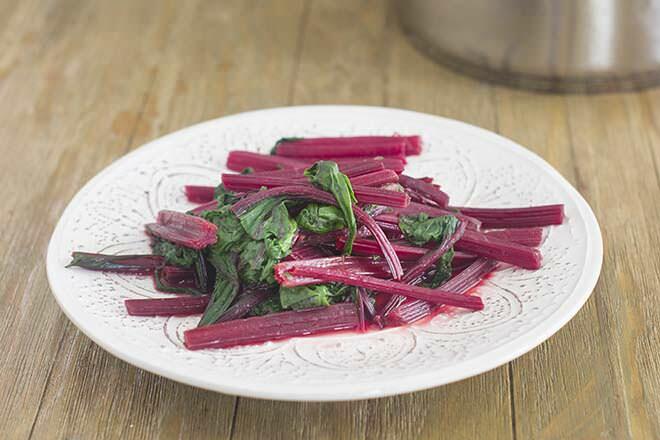 The tops from beets, the stems and leaves which are together known as beet greens, are sweet and delicious when prepared very simply by simmering them for a short time and then stirring them with butter and salt. Trim the beet greens from the beets. 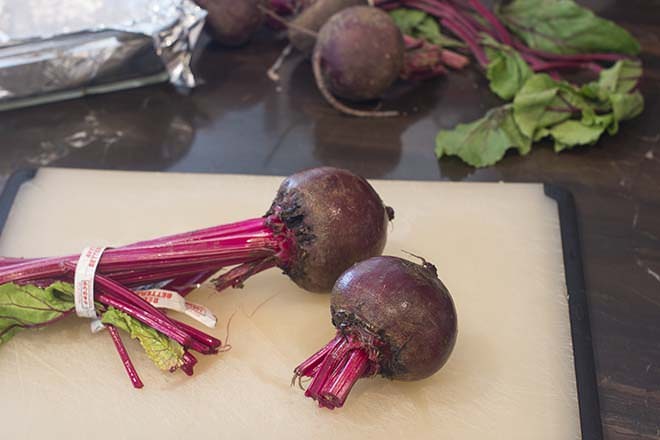 Leave a good inch of stem attached to the beets because that’s best for roasting beets (it stops the beets from bleeding red as much if you don’t actually cut into their flesh). Set beets aside for another use. Cut the stems and leave into 2 inch pieces. Put the pieces into a colander and rinse them really well. Often there is a lot of sandy, grainy dirt on the stems and leaves and you want to get rid of that. 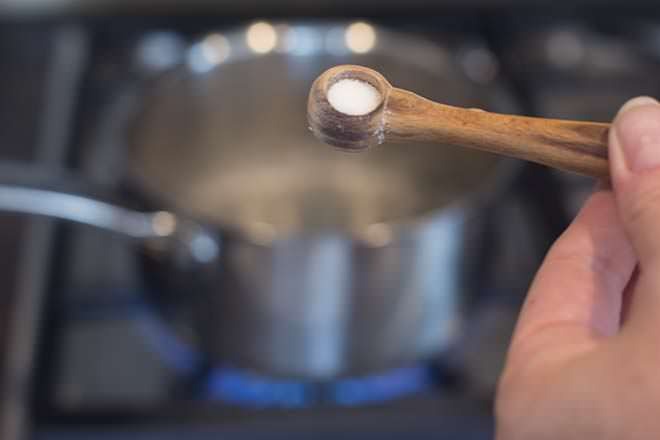 Put about an inch of water into a medium sauce pan and bring it to a boil. Add your stems and leaves to the sauce pan. Bring back to a boil over high heat and then stir and reduce to a simmer. Cook for 3-5 minutes until a stem is very soft when pierced with a fork. Drain the beet greens. Be sure to use a clean colander. You don’t want the dirt from before to end up on your cooked greens. 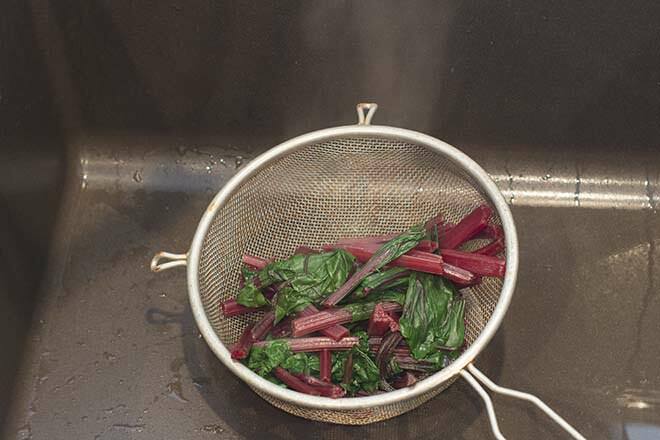 Return the beet greens and stems to the sauce pan or a serving dish and add about 1/2 tablespoon of butter. Stir and taste. Add salt if desired. This post originally appeared in December, 2017 and was revised and republished in July 2018.